I suggest you find a grown-up to share this activity with you. Note: The cheese will make the asteroids more delicious, but when it melts, the asteroids might go flat. If you want more realistic asteroids that don't taste quite as interesting, leave out the cheese. Turn on your oven to 375° Fahrenheit (190 Celsius). Make the mashed potatoes. Make a lot (8 cups) or a little (4 cups). Add the cheese (if you want), butter, salt and pepper to the potatoes and mix well. The mixture should stick together. If it's too dry, add a little milk. If it's too moist, add a little flour (start with 2 tablespoons). Take a handful of potatoes (about 1/2 cup or more) and shape it into your own idea of an interesting asteroid shape. Use your fingers to poke dents in it for craters. Here are a few real asteroids to give you some ideas. (These rocks are not all the same size, even though they look nearly so in these pictures!) The one on the left is Gaspra, in the middle is Ida, and at the right is Dactyl (which is actually a tiny "moon" of Ida). All these pictures were taken by the spacecraft Galileo. Set the asteroid on the greased cookie sheet. Put the cookie sheet full of asteroids in the hot oven for about 20 to 25 minutes, or until they are brown. Using the hot pads or oven mitt, remove the cookie sheet from the oven, and using the large spoon, transfer the asteroids to a serving plate. Asteroids are chunks of rock that never quite made it to full-fledged planet-hood when our solar system formed. Most of them orbit the sun in a "belt" between Mars (the fourth planet) and Jupiter (the fifth planet). But some asteroids have orbits that cross or come close to Earth's orbit. You may have heard that it might have been an asteroid slamming into Earth about 65 million years ago that wiped out the dinosaurs. Hmmm. Where are the air traffic controllers when you really need them? We think there may be about 100,000 asteroids, from 1000 kilometers (600 miles) across down to about 1 kilometer across. We are curious about asteroids because they may tell us interesting things about how our solar system (and maybe others) formed in the first place. Because they are so small, nothing much has happened to change them in all this time. No volcanoes, no water, no weather, not even much gravity to squish things together. Asteroids are chunks of rock that never quite made it to full-fledged planet-hood when our solar system formed. Because asteroids are so small and (we hope) far away, they are very hard to see from Earth. 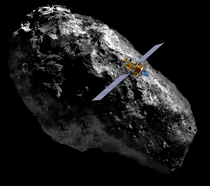 However, the Deep Space 1 spacecraft came closer to an asteroid than any other spacecraft at the time without actually landing on it (which the NEAR spacecraft did February 12, 2001 on asteroid Eros). Deep Space 1 flew within 15 kilometers (about 10 miles) of Braille on July 29, 1999. Deep Space 1 took pictures and gathered information about the material making up the asteroid. It observed and measured its size, shape, surface features, and brightness. It also measured what happens to the solar wind when it flows around the asteroid. On Earth, wind is a stream of moving air particles. In space, solar wind is a stream of energetic particles blown off by the Sun.